When it comes to rare breeds Falcon motorcycles occupy that elusive space at the pinnacle of design, style, speed and performance – they are quite possibly the most beautiful of all truly vintage styled, yet modern, innovative motorcycles. 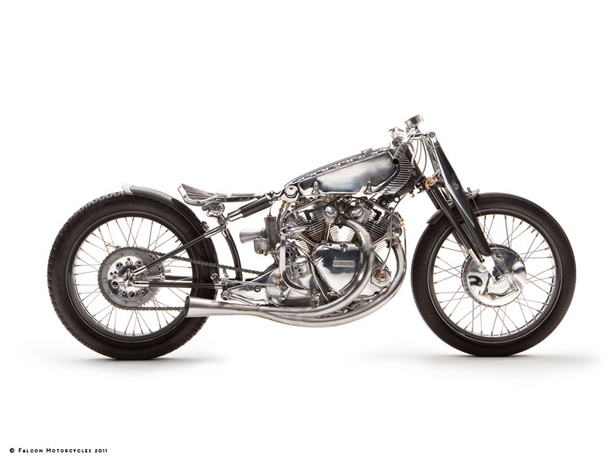 After a decade hand building motorcycle customs around vintage British engines, the mastermind behind Falcon Motorcycles, Ian Barry, set out to complete only ten, one-of a-kind-machines. His previous clients included members of rock groups Them Crooked Vultures, Queens of the Stone Age, and actors Jason Lee and Giovanni Ribisi. 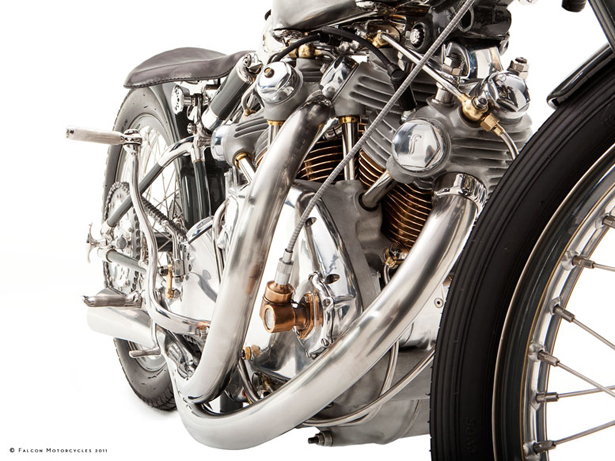 What makes Falcon motorcycles so rarified is that Ian has again chosen to build his bikes around the engines of ten iconic and historic British bikes but with an unsurpassed attention to aesthetics and modern innovation. Some of the unique motorcycle engines Falcon will use in future bikes include a 1967 Velocette Thruxton, a 1936 Norton ‘International’ cam cam, a prewar ‘Ajay cammy’, BSA Gold Star, a Cobentry Rudge and avintage J.A.P Brough Superior engine. 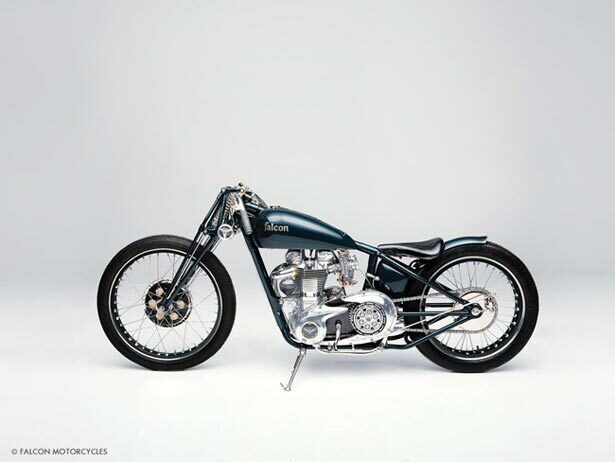 The Kestrel was built around a 1970 Triumph Bonneville engine whilst The Bullet was built around a 1950 pre-unit Triumph Thunderbird with a strong board track sensibilty. The Altai will be built around the highly rare 1936 Ariel Square 4 machine. The Falcon Black is a unique machine – designed, engineered and built around a 1952 British Vincent Black Shadow engine. The original C series Vincent Black Shadow housed a 998 cc, 50 degree overhead valve, V-twin engine running at 7.3:1 – capable of 125 mph (201 km/h). Falcon’s Black cyclinders are custom machined in house from two solid pieces of bronze alloy, bored and honed to achieve a perfect interference fit with the original Vincent cylinder liners. The lightweight aluminium tankswere formed around hand carved wooden bucks and “shrunk” to fit using only hammers over a two and half month period. In Vincent tradition the oil reservoir is housed within the upper member of the bikes frame, hand crafted from stainless steel and feature unique cooling fins and channels to push air to the heads. The fork blades for the Falcon Black are ‘Girdraulic’ 7075 T6 aluminum – 10oz lighter & significantly stronger than stock – these blades are shortened to achieve a lower center of gravity.The original Vincent spring boxes are modified to house one-off modern coil over gas shocks in a free flowing, needle bearing fork assembly – replacing all the original bronze bushings in the link pivot points and the spring box eyes. The Black’s longer swingarm uses a 1928 Phil Vincent design and DOM steel for improved uniformity, strength and stability. Both the front and rear wheels echo finned Vincent Black Lightning racing brakes but with a greater diameter of 8” for a wider braking surface area with the drum liners manufactured from locomotive cylinders. The BLack looks set to hit around 140+ mph. Ian’s focus delivers deliver the ultimate riding experience through the most meticulous attention to detail combined with real passion and hard, hard work – The Kestrel took around 2000 man hours. 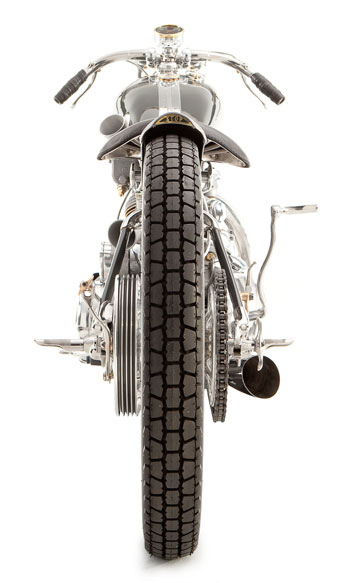 Theses bikes are fully functioning, stripped down racers styled into high speed works of classic motorcycle art. There will be only ten Falcon Motorcycles in the world, and only one of each design. Ian also plays guitar for Black Math Horseman. The Falcon Motorcycles website is here.